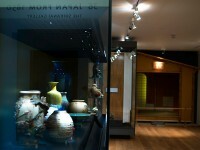 Presented by the Khalili Family Collection of Japanese Art, in honour of Dr Oliver Impey, 2000. 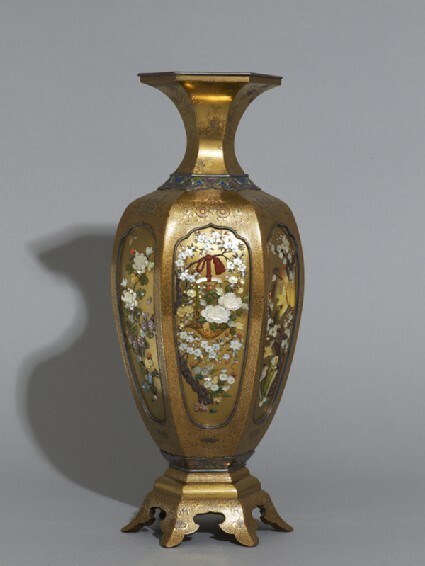 A pair of Shibayama vases of hexagonal baluster shape in gold lacquer, the rims lined in silver, the neck with raised lacquer flowers and leaves on a matt gold ground and with cloisonné enamel collars. The body with ovoid panels foliated at the top, of inlays of flowers and birds in high relief in pearl-shell, coral and ivory reserved on a hirame ground, the feet of spear form. Signature: Masaaki (on pearly inset on base). Very little in known of the makers of this, the Shibayama technique of inlays of a wide variety of materials into lacquer or ivory. The product of quite large workshops, the quality of inlay varies quite as much as does that of cloisonné; here the quality is very fine. Sometimes outworkers were used to supply standard cutout figures of, say, mandarin ducks, which then could be incorporated into almost any picture; curiously, there seems to be no falling-off of quality in the case of such outworking, but no doubt this, too, varied. The technique may derive remotely from the work of Ritsuō (Ogawa Haritsu, 1663-1747), but does not seem to have been consolidated until the early Meiji period, when Shibayama Senzō won a prize in the First National Industrial Exposition in 1879. Little in known of the subsequent history of the Shibayama family, though the names of several members can be found on high quality objects made in the technique.